The online version of this article ( https://doi.org/10.1186/s40793-018-0331-1) contains supplementary material, which is available to authorized users. Bacillus thuringiensis is a rod-shaped, Gram-positive bacterium that has been isolated from a variety of ecological niches including soil, aquatic environments, and dead insects, among many others . B. thuringiensis is known for its utility as a bioinsecticide due to its ability to produce parasporal crystals that contain protein toxins (e.g. Cry proteins, also called δ-endotoxins) during its sporulation and stationary growth phase . These protein toxins have also been successfully introduced to genetically modified crops, as exemplified in Bt corn, rendering these crops resistant to specific insect pests . The protein toxins have been shown to be safe to plants, beneficial insects, and mammals due to the absence of specific receptors that are normally only found in the target organisms [4, 5]. The potential of B. thuringiensis to serve as an alternative to chemical insecticides has driven the discovery of new B. thuringiensis strains that may lead to the identification of novel protein toxins with potential use in pest management [1, 6]. Aside from the insecticidal properties of B. thuringiensis , it has also been reported to exhibit antibacterial, antifungal, antibiofilm and emulsifying activities [7, 8]. In general, the Bacillus species are known to be rich sources of antimicrobial compounds [9, 10, 11, 12]. For B. thuringiensis , its antibacterial effects can be attributed to a wide range of compounds including bacteriocins and lipopeptides . On the other hand, its antifungal activity has been attributed to the production of compounds such as zwittermycin, chitinase, and lipopeptides . 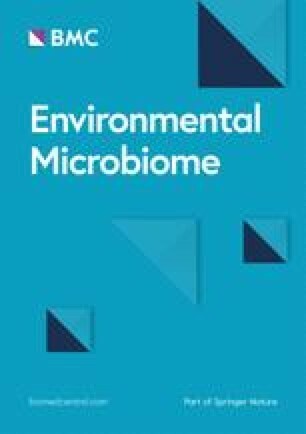 In this study, the whole genome sequence of B. thuringiensis DNG9 that was isolated from an oil-contaminated slough in Baraki-Algiers, Algeria was determined. This strain was chosen for sequencing due to its strong antimicrobial and emulsifying properties. It was the aim of this work to obtain a better understanding of the observed bioactivities based on the genes encoded in its genome. The draft genome of DNG9 is 6,057,430 bp with 34.9% GC content, similar to the genomes of other Bacillus thuringiensis strains [34, 35, 36], and contained 38 scaffolds with N50 of 347,259 bp. A total of 135 RNA genes and 284 pseudogenes were annotated by IMG/M and PGAP, respectively (Table 3). Annotation using the DOE-JGI IMG/M pipeline revealed 6109 total coding sequences of which 4463 have functional predictions. Conversely, RAST annotation pipeline predicted 6055 coding sequences; NCBI-PGAP revealed 6213 coding genes; and lastly, BASys annotated 6102 coding sequences. The 4463 coding sequences predicted in IMG/M pipeline were placed in 25 general clusters of orthologous (COG) functional gene catalogs. The distribution of these protein-coding genes based on COG function is listed in Table 4. 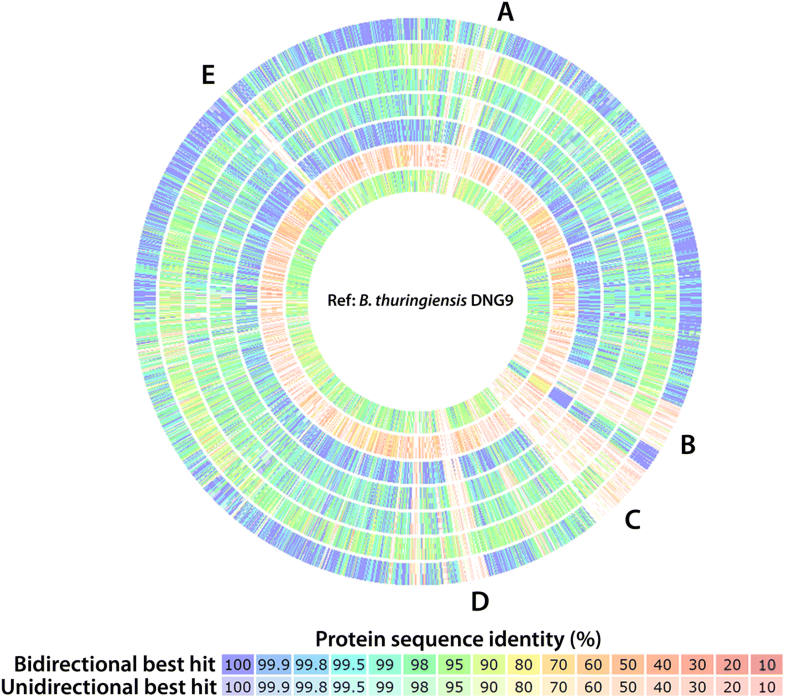 The 6.06 Mbp draft genome map of DNG9, as aligned against the type strain B. thuringiensis Berliner ATCC 10792, is presented in Fig. 3. DNG9 was found to be most active against Lactococcus lactis subsp. cremoris HP (Fig. 1d) [37, 38], and was also active against Carnobacterium divergens LV13 , Salmonella. 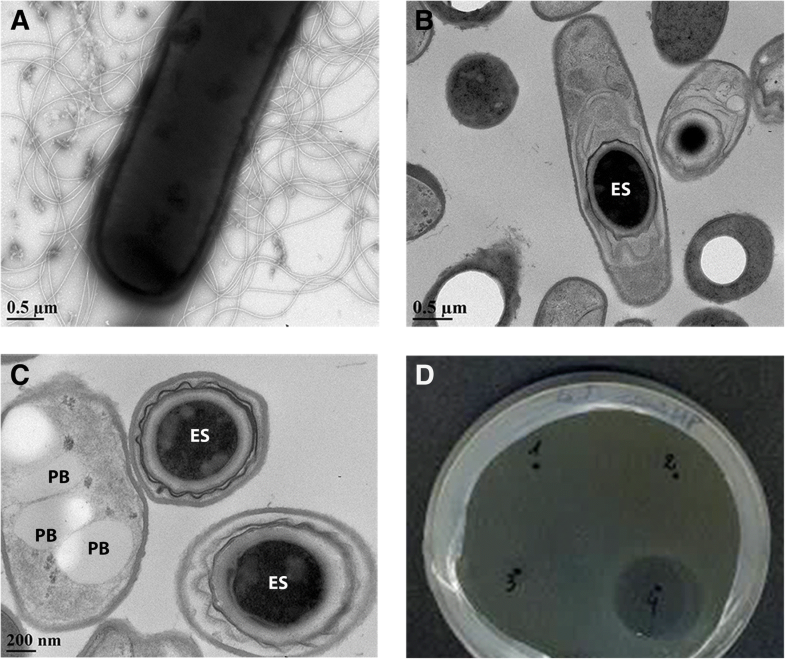 enterica Typhimurium ATCC 23564 , and Micrococcus sp. ATCC 700405  but not against Escherichia coli JM109 [42, 43], Pseudomonas aeruginosa ATCC 14217 [42, 44], and Enterococcus faecalis 710C . Conversely, DNG9 was also found to be active against the fungus Galactomyces geotrichum MUCL 28959 but not Aspergillus niger ATCC 9142 and Candida albicans ATCC 10231. The antiSMASH 4.0 server predicted that DNG9 genome carries the gene clusters responsible for the production of several secondary metabolites including antibiotics, siderophores, and biopolymers. 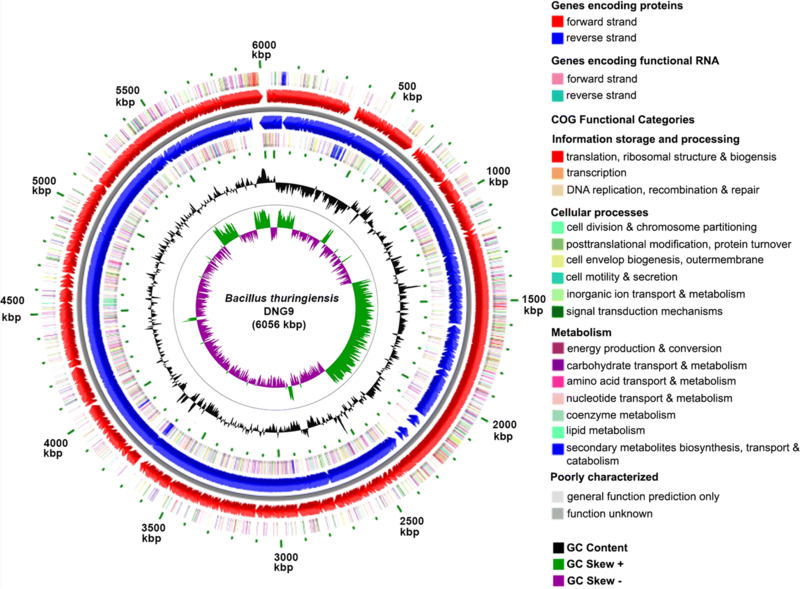 The genome was found to encode gene clusters with complete homology to the biosynthetic gene clusters of the antifungal compound, zwittermycin A (Fig. 4a), the iron-siderophore, petrobactin (Fig. 4b), and the bioplastic precursor, polyhydroxyalkanoates (PHAs) (Fig. 4c). The aminopolyol compound zwittermycin A was previously shown to suppress fungal-oomycete diseases in plants [46, 47], suggesting that the antifungal activity of DNG9 could be attributed to this secondary metabolite. The presence of siderophores, like petrobactin and bacillibactin, in the genome of DNG9 suggests its iron acquisition abilities. These gene clusters are not exclusive in B. thuringiensis but are also found in the genomes of other members of the Bacillus cereus sensu lato group [48, 49, 50]. Both antiSMASH 4.0 and BAGEL 4.0 servers also predicted a number of novel bacteriocins, mainly belonging to the class referred to as lanthipeptides (Fig. 4d, e, f). Lastly, Bt_toxin scanner revealed that cry genes encoding the insecticidal protein associated with B. thuringiensis is present in DNG9 genome, two homologs of cry41 and one homolog of cry6 genes. The wide biological target range of DNG9, including its antibacterial, antifungal and insecticidal properties, could be attributed to these bioactive compounds.